Predators and prey on oyster reefs over hundreds of miles of coastline. Dr. David Kimbro, Dr. Randall Hughes and their colleagues study predator-prey relationships. 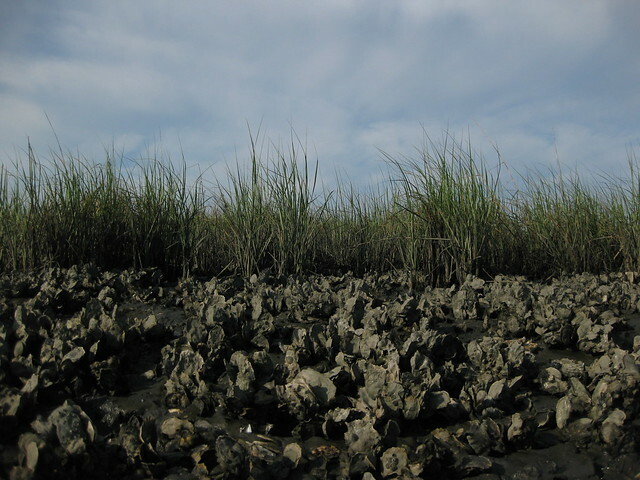 Those prey species are often consumers of ecosystem building species such as oysters and marsh cordgrass, and slight changes in the relationships between predators and consumers can have huge consequences for the salt marsh and oyster reef habitats. By eating and scaring consumers, predators can have a positive effect on ecosystems. What David and Randall wanted to know is, how consistent is this effect in different locations? With that in mind, they and their colleagues embarked on a massive NSF funded study that spanned several states and hundreds of miles of coastline. To understand what’s at stake, we look at an important service provided by oysters. In this video, David breaks down the complicated relationship between oysters and nutrients. All living things need nitrogen, but too much of a good thing can have devastating effects. Oysters can help, if they aren’t scared. Oysters make choices. They pick a place to live, and they choose when to eat. Oysters can also be scared. David and Randall explain why an oyster’s fear can keep it from providing valuable ecosystem services. Oysters aren’t the only ones who get scared on the reef. Predators benefit an ecosystem by eating the animals that eat habitat building plants, or habitat building animals like oysters. Just like consumers can scare oysters and alter their behavior, consumers are in turn scared by larger predators. So how do you measure the effects of fear and predation over hundreds of miles of coastline? One way is to look at how a young oyster grows. David, Randall & co.’s spat tile experiments let them measure this growth in a variety of conditions. One of an oysters primary consumers is the mud crab. Until just recently, David and Randall’s experiments were based on mud crabs receiving chemical signals that alerted them to the presence of predators and which caused them to change their feeding behavior. A partnership with WFSU-TV set this research on a surprising new path. Dr. David Kimbro is starting to see a pattern across Florida oyster reefs affected by loss of freshwater input. Is the prevalence of oyster eating snails the cause or merely a symptom of oyster reef decline? (Read more about David’s Apalachicola Bay research here). David and Randall’s study is funded by the National Science Foundation.